Check it out! The wreath project I've mention is finally done. I made this wreath for a friend as a housewarming present, and it's now hanging on her lovely walls. 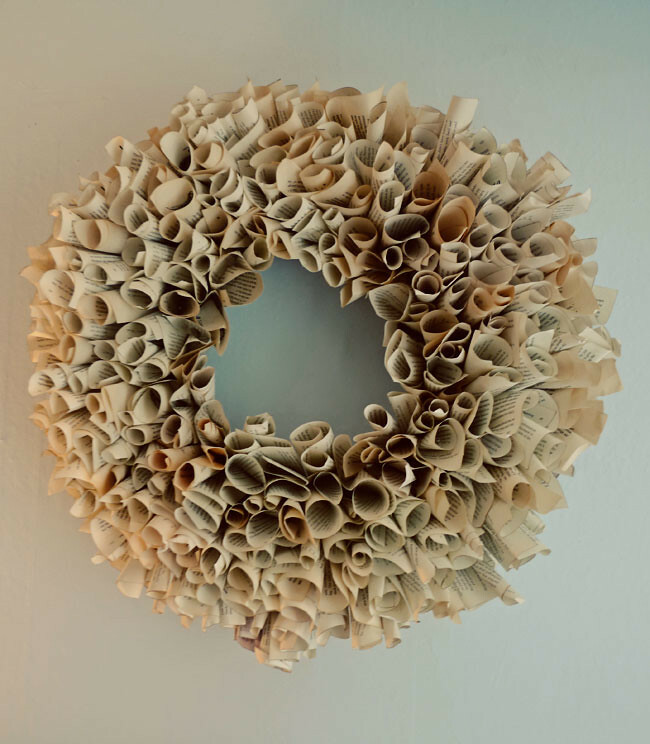 The wreath is made using pages from old books, a wreath form, and a whole lot of hot glue... not to mention several hours of time. It's very simple to do, see the DIY instructions. - Unless you want to invest 12+ hours, use the wreath size recommended. I used a 24" form, and this made my wreath turn out kinda gigantic (luckily it still fits perfectly in its new home). - Use a few different books for varied page color and text size. I got my books from Goodwill, so I didn't have to feel bad about tearing up some classic literature. I did also mix in one book from the dollar store... if you use a new book, don't skip the painting of the edges, it really helps them stand out once rolled. - Have a cup of cold water out to dip your fingers in when you burn them on the hot glue. Because it will happen. About every 30 seconds. - Don't fret about getting your rolling technique perfect, experiment a few times until you get the hang of it. I found it was best to roll my page how I wanted, hot glue it to make it stay as formed, and then attach it to the wreath. This is a super easy project with stunning results, and perfect to do while sitting on the couch watching a movie. I think a pair of these wreaths would look gorgeous hanging on the doors of a wedding chapel! Thanks to Lindsay for the DIY instructions! Thanks for sharing, Erin! It's lovely—I want to try one!